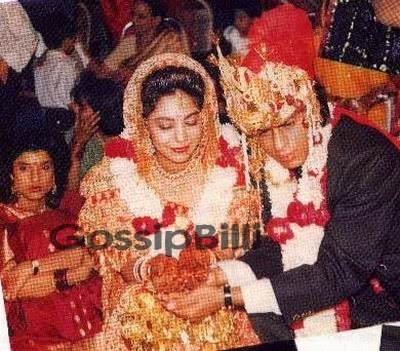 Shah Rukh and Gauri's love story is a typical Bollywood Love Story. It has all the spices, fights, tears, togetherness and true love. so he went to her and said "Mujhe bhi apna bhai bana lo" ;). Gauri took a instant liking for charming SRK and their relationship continued to add a new chapter with every passing day, but it has it's ups and downs like any other teenage love story. The road to happiness was a thorny one as Shah Rukh was Muslim and Gauri, Hindu. On Gauri's birthday SRK came to attend the birthday party and introduced himself as Abhinav to make her parents feel he was a Hindu boy, now the couple blissfully remember it as silly and childish :). King Khan was extremely possessive about his lady love and they fought frequently over it. He can’t stand Gauri wearing a bikni in a swimming pool. It became a Emotional Atyachaar for Gauri, she got fed up one day (Year 1989) and took off to Mumbai without telling him. Just a day ago he celebrated her birthday with so much enthusiasm and love, decorated him room the best way he could and giving her lots of presents. It was when Gauri had left for Mumbai then only Shahrukh released how much he loves her and he ended up telling everything to his mother who was supportive and gave him Rs 10,000, advised him to go to Mumbai and get his love back. Gauri's parents were hard to win over but neither Shah Rukh nor Gauri wanted to elope. At long last her parents gave their consent, and they tied the knot on October 25, 1991 in a typical Hindu marriage. Now they are happily married for 2 decades and stood as an example for love, fidelity and mutual trust. Men, in or outside the industry, don’t go around proclaiming such obsessive and rebellious love for their wives. Even those, few or more, who do love their wives, normally don’t find it necessary to make a feverish display of their ardour but SRK always praised Gauri without any in-habitation.